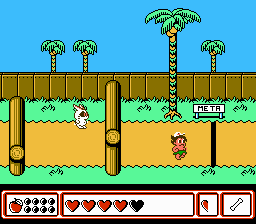 Takahashi Meijin no Bouken Jima IV is an action platformer game for the Nintendo Entertainment System. 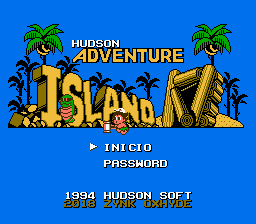 The game was not release in the West where it could have received an official title as Adventure Island IV. On his 4th adventure, Master Higgins lives peacefully on an island with his girlfriend Tina and his dinosaur friends. Suddenly, a mysterious evil face appeared and kidnapped the dinosaurs. 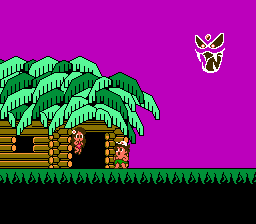 Master Higgins is set to rescue them and defeat the island bosses. The gameplay is quite different from previous games where the player just clears a stage from point A to point B. The game is more of an action adventure game, the player collect hearts to increase max HP, play mini-games to get new items, and defeat bosses to gain new tools and dinosaur allies. And the game uses a password system. 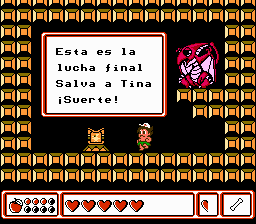 This is s Spanish translation for Takahashi Meijin No Bouken Jima IV for the Famicom. It translates most of the text in the game, introducing spanish language punctuation symbols. It is based on the English translation by Zynk Oxhyde.